Painters and Poets: W. H. Auden Forges "The Shield of Achilles"
So begins Homer’s lyrical account of how the blacksmith god forged the famous Shield of Achilles. 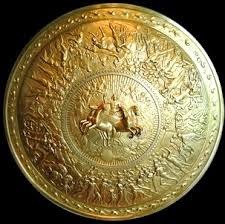 The god then hammers the shield into five sections and covers them with images of the earth, sky, sea, sun, moon, and stars. He then forges onto the shield pictures of two cities, a wedding celebration, a murder trial, an advancing army, domestic and wild beasts, a war, a field full of plowmen, a vineyard, a meadow, and dancing boys and girls. Homer’s description occurs in the 18th chapter of The Illiad, which I’ve been reading lately—as well as Alice Oswald’s “excavation” of it called Memorial. Homer’s is among the earliest examples of “ekphrasis”—a poetic rendering of a work of art. 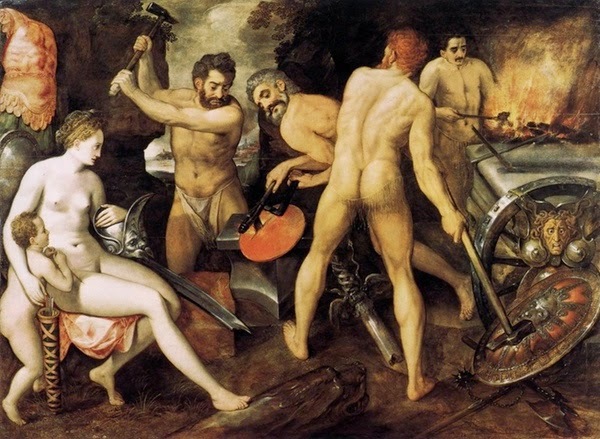 Frans Floris, Venus at Vulcan's Forge, 1560-64.
forges the armor for Achilles's Trojan conquest. This is an amazing piece of work - like music from heaven. Beautiful images, great text and incredible poems. Congratulation Elana. Greatest contemporary poem related to the understanding and extension of Greek mythology.